Need a photo theme for WordPress? Say hello to Focal Point. 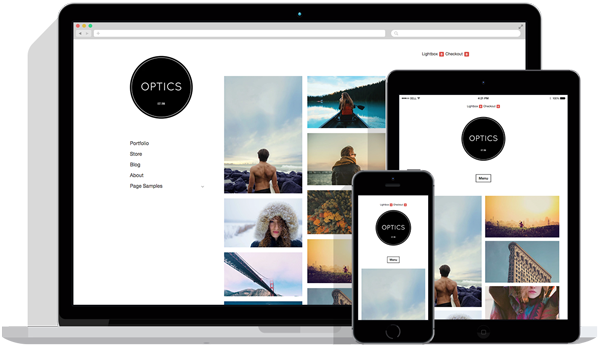 Focal Point is a one or two-column photo portfolio theme for WordPress built atop our Base theme framework. The design and functionality was conceived from feedback from our users. When you speak, we listen. Then we build! Focal Point includes four optional styles to choose from (Centered, Centered Dark, Compact, Compact Dark) so you can easily change between light and dark, centered or top right menu navigation. The homepage includes a special app, called Category Post Slider, which is perfect for displaying posts from your photoblog, blog or iPhone gallery beneath the main homepage area. The screenshot and the demo site both use our free GPP Welcome Message and GPP Slideshow plugins in the Home widgetized area. Automatic theme updates – When a new version is released, you can update automatically from your WordPress Dashboard with one click. You must have a valid license key (available on your Member Dashboard for paid subscribers) and use Base 1.1 or higher. Booya! Category Post Slider App – Display posts in a horizontally scrolling list. Perfect for displaying a photoblog or iPhone gallery. Four Alternative Stylesheets – Choose from Centered, Centered Dark, Compact, Compact Dark styles so you can easily change between light and dark colors, centered or top right menu navigation. Custom Fonts – Want to change your font, no problem! Custom CSS – Easily add custom CSS to your theme options panel. This future-proofs your customizations. Shortcodes – These allow you to easily add column layouts, boxes and buttons to your posts and pages without modifying CSS, HTML or PHP. Drop Down Menu – Nestle links inside parent or child menu links for a clean, intuitive design. Blog Page Template – Display all blog posts on a separate page. This helps maintain clear separation between your portfolio and blog posts. Supports GPP Plugins – Download and install any one of the GPP Plugins and use them in any of Focal Point’s widgetized areas. The first three users who submit their Focal Point-powered theme to our Theme Showcase will win a free annual theme subscription. Jump on it! I have to ask more precisely: which video formats and players are supported with this theme? From what I see right now GPP only supports FLV??? What about videojs and webm / theora??? I need to support all modern devices, right now I am stuck with GPP themes, no support for all modern video formats??? This is simply awesome! Is there a way to remove the ‘Hello’ from above the picture? disable by installing the GPP Welcome Message plugin. Sorry for missing this. We receive notifications of comments via email so we don’t have to check individual posts for new comments. I’ll respond below to your questions now that I see them. Just wonder why the preview theme (demo) of Focal Point themes look different? Thank you a lot for this information.I just wanted to add that there are so many amazing ideas here, on paper press. Thank you! I think all features seem very useful, especially automatic updates and that thing with blog templates, but I can also relate to the question about video support, as I would like to know whether it is possible and make the best of it. Yes, you can use Video in Focal Point on Posts, Pages and Widgets. How can i use Category Post Slider App? Hi! We are using Focal Point with a GPP Slideshow – is there a way to keep the height of the photos consistent as the slideshow scrolls by? we have both horizontal and vertical photos and the vertical ones end up being too big for the screen, and it pushes everything below it up and down as it goes. http://www.hinkeldesigngroup.com/wp Thanks!